at Santiago de Compostela, was a highlight of a recent trip to Spain and Portugal. It is natural to have expectations when traveling. I, for one, use my expectations to gauge the success of a trip. That is why when returning from a recent trip to Portugal and Spain, I began reflecting on whether it had lived up to my expectations. However, to answer this question, I first had to set out very clearly what these expectations were. I concluded that when traveling to Europe, my primary hope is to experience firsthand, the spirit of a civilization that was turned entirely towards God and His Church. I hope to see the remnants of Christian civilization, which began with the Middle Ages and continued on its course until diverted by the heinous revolutionary process, now more than five centuries old. That is not to say that bad people and rulers did not exist during the Middle Ages. However, the impetus of that society was to establish the Kingdom of Christ on earth. The effects are still apparent today in everything from art and architecture to cuisine and music. My expectations would be fulfilled to the extent that I saw in these effects the glory of that past civilization. Although the manifestations of this civilization and how it touches those who visit its ruins are as varied as there are people who go to Europe, I hope to develop three aspects and discuss whether my expectations were fulfilled. The fortress-like appearance of the Cathedral of Oporto is balanced by the delicate spires which bestow levity on the façade. The first effect of Christian civilization I will discuss is what I will refer to as balance. Balance is that quality whereby something always possesses the complimentary opposite of its extreme virtues or to create equilibrium. Such balancing of extremes is seen in the relationship between God’s Mercy and Justice. Thus, the same God, Who shed every drop of His Most Precious Blood for man in a supreme act of mercy, justly sends the wicked to an eternal punishment. This balanced expression of life’s complimentary opposites is an essential element for any civilization that strives towards the Christian ideal and European Christendom was filled with it. This is evidenced in everything from its architecture and artwork to its cuisine and music. In my travels through Portugal, I saw this balance clearly while visiting the Cathedral in Oporto. Built in the twelfth century, the Cathedral of Oporto demonstrates austerity and fortitude. It is the work of a people who saw the world as a continual struggle and valley of tears, fraught with difficulties of every sort. This is seen in the fortress-like appearance of the cathedral’s façade and exterior of rough stone. The immensity of the pillars that hold up the ceiling on the inside, impress one with the weight of their burden. The delicate double columns in the cathedral’s cloister remind the faithful that Christ’s yoke is easy and His burden light. However, the cathedral’s towers are topped with delicate spires bestowing levity on the surroundings and pointing upwards towards a merciful God, Who overcame the world and wants us to gain an eternal reward of joyful existence with Him. Likewise, the delicate vaulting in the ceiling of the cloister which sits upon light double columns, strengthen the convictions that Christ’s yoke is easy and His burden light. Several sculptures of the Blessed Virgin throughout the structure reassure the faithful that a compassionate Mother is ever willing to come to their aid. This balance is present even in the cuisine of Europe. While on pilgrimage at Fatima, Portugal, my brother (who was traveling with me) and I sought a quick lunch. For such occasions, modern society offers fast food, with its aggressive, one-dimensional assault on the palate. We opted more traditional European fare at a local grocery store, where we purchased homemade bread, cheese, chouriço and a bottle of wine. Although very strong tasting, the flavors did not assault our palates. The food was simple but balanced and full of nuances. This experience stood out in sharp contrast to the thoughtless meals I have endured at many a fast food restaurant, where food explodes with sensation but lacks any of that transcendent nuance that feeds the soul. The Templar monastery of Tomar juts out of the surroundings like a great fortress. Remnants of this military spirit are evident throughout Spain and Portugal, whose histories recount long struggles against Muslim conquerors. In Spain, the Reconquest took nearly eight centuries. These long centuries of fighting strongly marked the culture of these countries. Although the remnants of this crusading spirit exist throughout Portugal and Spain, it was especially evident at the Templar monastery of Tomar and the Basilica of Santiago de Compostela. Imposing walls shows that the monks of Tomar did more than just pray. If the mere existence of a military order demonstrates this spirit, touring a Templar stronghold immerses one in it. The monastery of Tomar is full of all the austerity and trappings you would expect to find in a monastery. The chapel has choir stalls for praying the Divine Office. There is a chapter room and religious imagery abounds. Yet the exterior shows that these monks did more than pray. 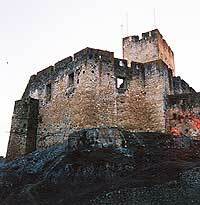 It juts out of the surroundings like a great fortress. High and imposing walls surround the entire compound. These walls are topped with crenulations to allow archers to shoot without exposing themselves to enemy fire. Viewing the combination of the monastic and military lives, one is drawn to the conclusion that so perfect a consonance of such diverse fields of action could only have found a home within the Catholic Church. 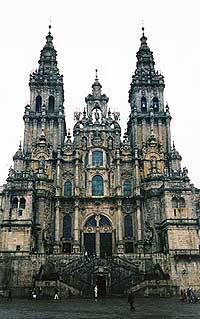 The Basilica of Santiago de Compostela also portrays this crusading spirit. 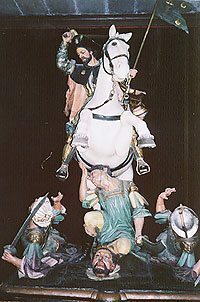 Shortly after the miraculous recovery of the remains of Saint James the Apostle, the saint appeared on a white horse to lead the Christian Spaniards in battle against Moorish invaders. A famous statue, remembering Saint James’ military feats, resides in the Basilica in Santiago. Instantly, the Apostle gained the name Santiago Matomoros (Saint James the Moorslayer) and became a patron of the Reconquest. Although the idea of a saint apostle coming down from Heaven to lead men into battle may seem strange to the modern mind, nothing could be more normal to medieval man. Muslim invaders were endangering not only the future of Catholic Spain, but all Christendom. Facing this threat with force was not only entirely just, but obligatory. Remembrances of this apparition abound throughout the city of Santiago starting with the famous statue of Santiago Matomoros in the Basilica. The statue portrays Saint James on horseback, slaying turban-clad moors who surround him. There were two other statues remembering Saint James’ military feats in the square in front of the Basilica. 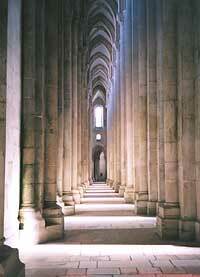 The monastery at Alcobaça, Portugal embodied another element of Christian Civilization: faith. 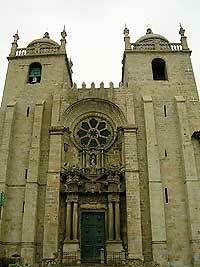 The monastery at Alcobaça embodies the faith of medieval man. 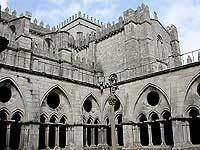 The monastery was founded in 1153 by Portugal’s first king, Afonso Henriques. At its height, it could house 999 monks, with one place reserved for the king, who lodged with the monks while traveling in that region. I was immediately struck by the contrast between this society and ours which prohibits public schools from putting up Christmas decorations. The difference is that the men of Christian Civilization were men of Faith and all society reflected that Faith. This is evident from great monasteries like Alcobaça, but also from the religious images that blanketed the city squares and buildings that I saw throughout Spain and Portugal. When leaving for Spain and Portugal, I had very defined expectations for my trip. I wanted to see and feel the reality of Christian civilization. My travels fulfilled these expectations entirely. I experienced the balance of complimentary opposites in the Cathedral of Oporto and the simple European cuisine. 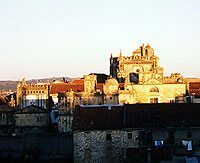 I felt the crusading spirit in the Templar stronghold of Tomar and the city of Santiago de Compostela and I witnessed the spirit of Faith which permeated all society, but especially great monasteries such as Alcobaça. I was imbued with the reality that a truly Christian order did exist and has left its remnants for all who care to experience them. If you have traveled to Europe in the past, reflect on your trip. Investigate whatever you admired and see for yourself whether or not it fits into this panorama of Christendom. If you plan on traveling there in the future take a few moments of your trip to analyze the remnants of Christian civilization and allow yourself to marvel at its beauty. When I tried this, my expectations were fulfilled. I am certain yours will be fulfilled as well. Referring to the Revolutionary process as described by Prof. Plinio Corrêa de Oliveira, in Revolution and Counter-revolution. Chouriço is a very strong tasting sausage. This entry was posted in Catholic Perspective and tagged architecture, Art, balance, battle, Bernard of Clairvaux, Cathedral, Catholic, Christ, Christian, civilization, Compostela, cuisine, culture, Defense, equilibrium, expectation, Fatima, fulfill, God, Kingdom, Middle Ages, Militant, music, Muslim, Oporto, opposite, perspective, Portugal, Reconquest, relation, revolution, Santiago, society, Spain, spirit, spiritual, Templar, TFP, Tradition, trip, truth, virtue, world by Michael Whitcraft. Bookmark the permalink.